First the good news. 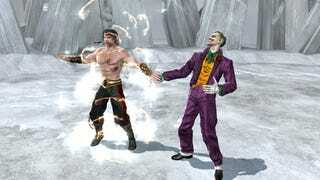 Mortal Kombat vs. DC Universe is still great fun. We played it from the comfort of the Kotaku couch this week and had a blast. Now the bad news. That amazing Joker fatality, the one where... well, if you haven't seen it yet, we'd suggest you watch it now. It's awesome. Anyway, it's been changed up a bit, toned down to just slightly less than awesome to secure that highly coveted T-rating that Midway and Warner Bros. are so adamant about. In the latest build, Joker still whips out his prank gun, a "BANG!" flag unfurling. Unfortunately, you won't see the follow up of Joker shooting someone in the face; that actually happens off screen now, the headshot safely out of sight.It's a minor change, but a noticeable one. We asked Midway's Ed Boon about the difficulty in getting that T-rating, something he said the team has been working closely with the ESRB on. They've sent "at least three" submissions to the ESRB, going in with something that's full of M-rated content, getting feedback and "scaling it back." Another Fatality that's seen some revision was Kitana's, one that involved her opponent being impaled by her trademark blade-fans. Initially, the first fan went into the torso, the other into the forehead. That second was a T-rating no-no. Double fans delivered to the chest, however, that's a T-rated way to end someone's life. Sure, it's disappointing — Joker's original finishing move was one of the best we've ever seen — but the game would simply not exist with an M-rating. We'll just have to take solace in the archived video-only version, occasionally rewatch it misty-eyed and forlorn, and realize we're going to get the game regardless.